Deirdre and I said our final and third goodbyes, her company had been great in Peru and Bolivia. I finally got away about 1000, the road took me out towards the airport and on into the desert again. 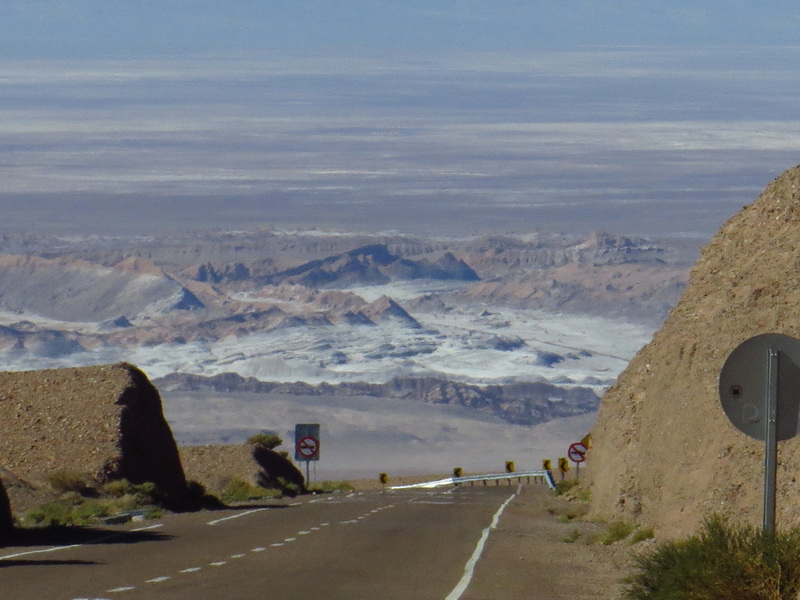 It was a gentle climb for miles away from Calama. The most striking things in the environment were again the immense landscape and the presence of a wind farm. I had hoped to buy water at Cerrillos, it turned out to be nothing more than an intersection to other pueblitos. It was a typical desert type of day, a few really hot hours from 1100 to about 1500. I was getting short on water, having only loaded enough to fill both drinking bottles. 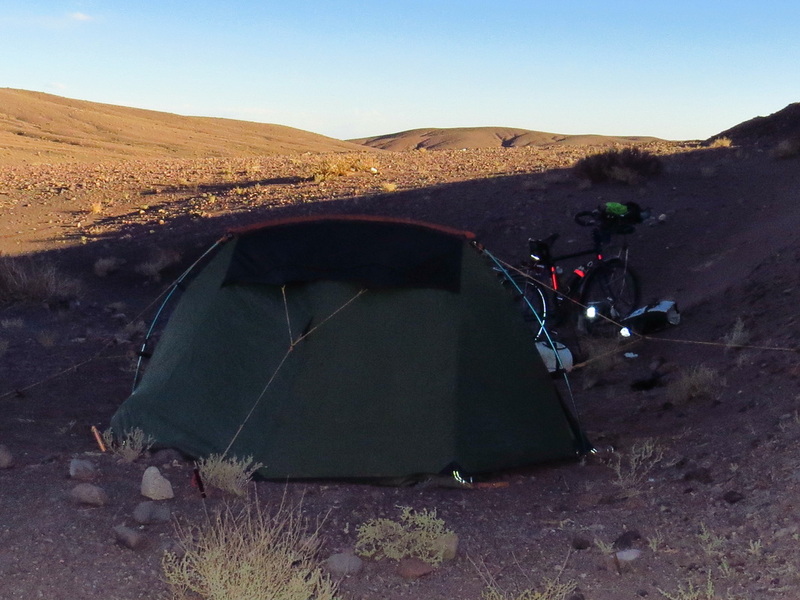 Firstly, 20km out of Calama a few road cyclists were flying downhill back to the city. Another guy cycling, my age was heading back, we stopped for a chat. He had a state of the art composite bike, my tent bag weighed more, we laughed. He gave me a couple of muesli bars. After Cerrillos, up ahead, a van pulled over to the side of the road. Riding past, the driver wound down his window and asked where I was heading. We spoke for some time. He gave me a heap of water in small bottles, much of which were drank as we talked. He continued to offer me muesli bars and orange juice, how timely. He was really interested in my travels. It’s great bumping into guys about my age. Nearly always the contrast between our respective lives is oh so different. I look at them, and think, that’s what I could have been doing and they look at me and probably think “What is he doing”! . These interactions are always pleasurable for all involved. Following this encounter, I was loaded with enough water, if, I was frugal, for the rest of the day and the nights camping. The almost flat rigidly straight road, bounded by rock and sand soon started to climb a bit into some hill country. It was a welcome change. By now, once again, I had great tail winds from the north laced with a bit of west. They were aiding me greatly. Once up at the top of this climb it was time to think about finding a nesting site for the evening. Just before the Rio Grande turnoff I changed into some warmer gear. That of a raincoat, water proof socks with my sandals and a beany. It was about 1700 and cooling off rapidly. The terrain offered little in the way of shelter from the now cross wind. The best I could hope for was shelter immediately below the road, where it was elevated through a low piece of terrain. That opportunity arose, pretty soon. Sneaking off the road between cars, saw me set up in a sandy spot below the leeward side of the road. Most traffic all day had been mining vehicles carrying workers back to their mines for the coming week. Anyway, it soon got very cold. Dinner was coffee and porridge, I was still being sustained from the huge meal Deirdre and I had eaten the night before. A retreat was made to my sleeping bag by 1900. My tent seemed like a large house after having shared it for 6 weeks. There was tons of room for me and all my gear. There was also plenty of room for the sand that invariably finds its way indoors in this environment. It is not super fine, thankfully. Sleep came really easy as I reflected on the last month. I had set up as to get the early morning sun. Tomorrows ride would be easy, some thirty odd km. The repairs to the tent frame poles worked like a treat. This pleased me very much. 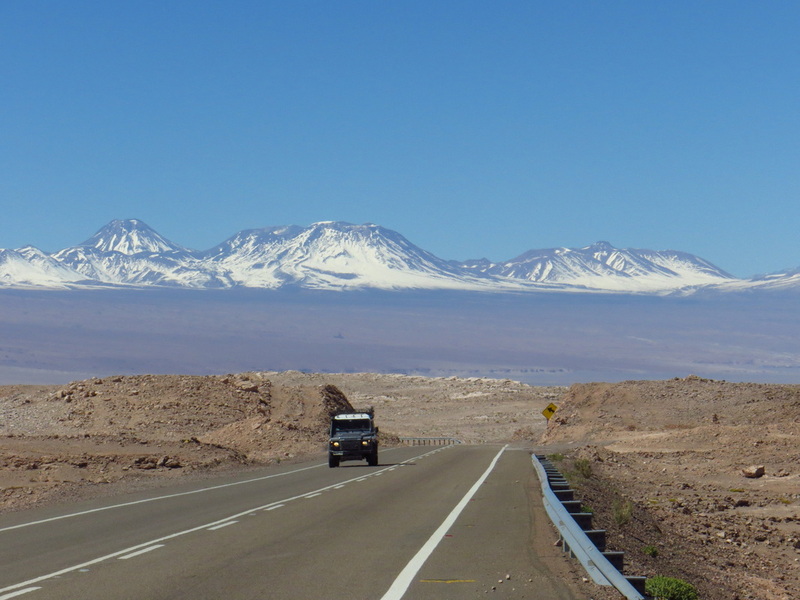 2/9/2013 Near Rio Grande turnoff to San Pedro de Atacama. My sleeping bag was not vacated till the sun rose and began to warm the tent. Though, reluctantly some ablution activities were required before sun up. I have never spent so much time bent over with my bare bum to the ground as I have done here during my travels. In such large open spaces, it is almost becoming second nature and natural. On the road, I don’t even get off the bike, just coming off the seat and standing over the bar to leak on the roads edge. Motorists have never acknowledged this necessity. I had to load the bike close to the road, as it would be impossible to move it up the loose sandy gradient back to the asphalt. Sometimes one wonders about carrying too much. I do have a lot of items that many other touring cyclists call luxuries, those being, a medium size computer, three man tent, tarp, and probably too many clothes, my foot wear consists of runners, Keen sandals, Noat casuals and thongs. Though, if you combine this weight and the unlimited time in which I have to move it, the burden is significantly lessened. A plus is, like today when I get to downhill runs, this weight propels me along at adrenalin rushing speeds. Soon I could see ahead of me a huge open valley with all sorts of formations, all this was backdropped with a lightly snow clad mountain range. For most of the descent I was coasting at near 70km/hr. Very pleasurable to say the least. With music playing, a huge vista before me and wind on my well protected face, it was all exhilarating. The road surface was one you could trust, having said that, the brakes were not used during proceedings. Arriving in San Pedro, with time to spare. I spent a couple of hours cruising about acquainting myself with the layout of the town. It was a tourist mecca, with pretty much all tiendas catering to this market, selling, clothing, food, sightseeing excursions and hiring bikes. I finally found a hostal, the Sol Atacama, $80 for three nights it was cheap here, I had a private room. The same money in Peru would have payed for 15 to 20 nights. Though to its credit there was god hot water and a great ambience with other travellers staying here. Time was spent here, relaxing, washing, chatting etc. Two other cyclists arrived, Kurt from the US and Loic from France, both in their late both in their late twenties and seasoned riders. It is always great to swap stories. They had ridden through the park in Sth Bolivia. They said the scenery and lakes were amazing. Though spent much time pushing their bikes and had got caught in the dust storm Deirdre and I faced and the snow. Their photos showed Flamingos on lagunas as thick as insulation in a house roof. I got the rear derailleur tuned on my bike and had to replace the rubber bar bag supports. The need for US dollars in Argentina saw me buy quite a few with Chileno pesos. 515 bought one dollar. Evidently in Argentina the best rate for Argentine pesos is on the streets using US dollars to buy them. 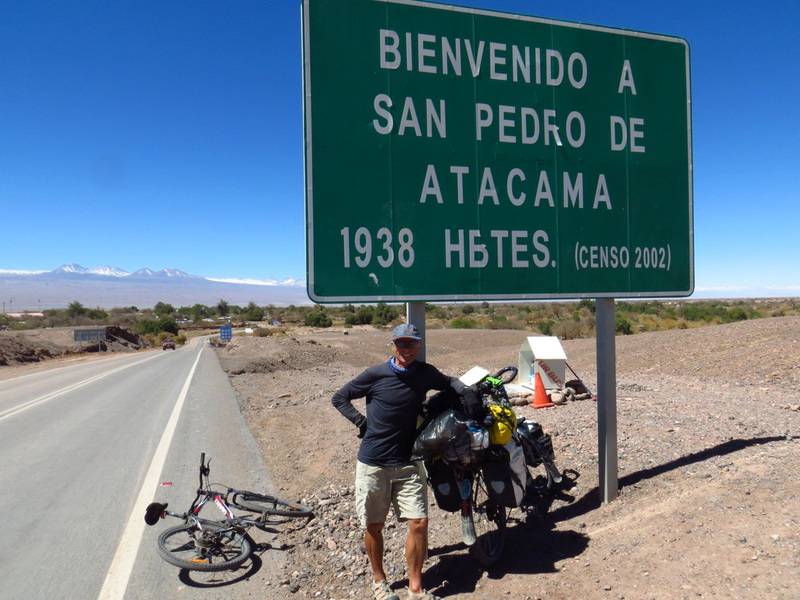 From here I hope to ride to Paso Jama on the Argentinean border. This passage will require plenty of water and food as there will be no food and water for some 200km. The road from here at 2500m rises to 4600m. The hostal has been great, with just 5 of us here and a few cats. Typical street. businesses open late in the morning, close and then open again for the evening. 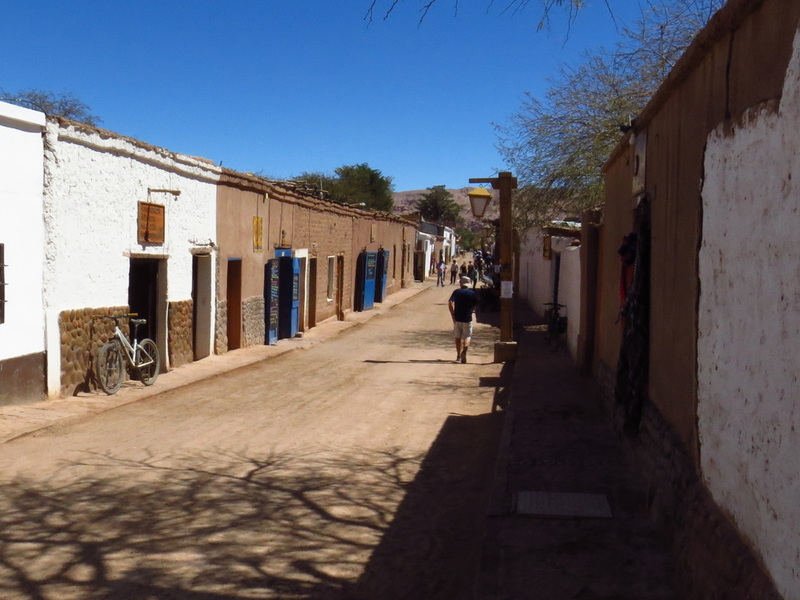 San Pedro de Atacama is a very laid back place with many natural tourist sites nearby, those of geysers, the Luna valley, sandboarding etc.